Known for his influential role in the debates that established the founding documents of the United States, Benjamin Franklin was not only an astute politician, but also an Atlantic citizen whose commitment to the American cause was informed by years spent in England and France. The life of this iconic founder provides an ideal opportunity for students to take a closer look at eighteenth century colonial society and the contested formation of the early American nation. In this carefully contextualized account, Nathan R. Kozuskanich considers the many facets of Franklin’s private and public lives, and shows how Franklin grappled with issues that still concern us today: the right to bear arms, the legacy of slavery, and the nature of American democracy. In a concise narrative bolstered by supporting primary documents, Benjamin Franklin: American Founder, Atlantic Citizen introduces students to the world of the burgeoning United States and enables them to understand the journey from imperial colonies to an independent nation dedicated to the premise that all men are created equal. "Nathan Kozuskanich’s Benjamin Franklin: American Founder, Atlantic Citizen gives us a well-constructed and comprehensive exploration of the life of one of the greatest figures of the American age of revolution. Presenting an account of his life as a printer, scientist, and statesman against the backdrop of the wider Atlantic world, this book draws on the latest thinking of a generation of historians in a style that undergraduates will enjoy." 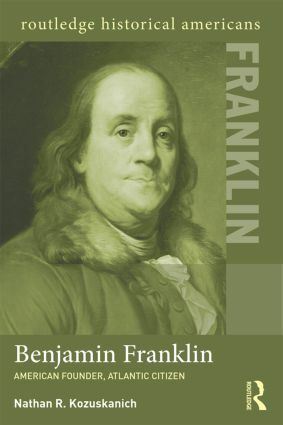 "Kozuskanich's elegant little biography of Benjamin Franklin is both engaging and accessible. Perfect for classroom use, it offers significant insights into the times and the man. Most importantly, it explains how an ordinary man, born and raised in ordinary circumstances, became such a extraordinary political and intellectual force in his own time and in our own." Nathan R. Kozuskanich is Associate Professor of History at Nipissing University in North Bay, Ontario.